Some things just don’t compute. The cover story of The Economist this week reads: “Are we there yet? America’s long, hard road to recovery.” Inside, the lead editorial talks about high unemployment and bleak prospects. 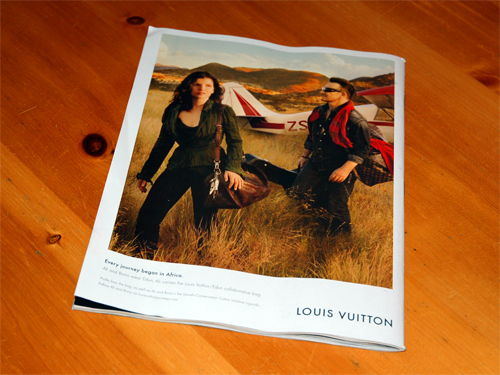 But never mind all that, the back cover of the magazine features a Louis Vuitton ad. You know, the folks who sell $500 sunglasses, $800 wallets, and $1600 handbags. And who might the model be in said ad? Yes, ladies and gentlemen, it’s Bono – the rock star who flies around the world moaning about climate change and African poverty. The duffle bag on his shoulder, called a Keepall 45, retails for US$1200 (before monogramming). Many of us, particularly in the developed world, will have to change our lifestyles. The era of [cheap] flights…is drawing to a close. We will have to shop, eat and travel more intelligently. We will have to pay more for our energy, and use less of it. So where exactly does the extreme conspicuous consumption represented by brands such as Louis Vuitton fit into that brave new world? Some days the cynical part of me begins to wonder whether the super-rich aren’t unconsciously attempting to re-institute the class system. Today’s inexpensive flights are, after all, within reach of the masses. If and when they disappear, folks like Bono, Leonardo DiCaprio, Prince Charles, Al Gore, and Oprah aren’t going to be affected. Those people already own – or happily rent – private jets. Nor do environmental campaigners such as David Suzuki show any signs that they intend to stop flying. If you’re wealthy enough to afford carbon offsets, apparently there’s no problem. Which means, of course, that when tough anti-global-warming policies are implemented the only people who’ll be denied the ability to fly are ordinary working people. It’s my life – and yours – that will be limited and constricted. Meanwhile, the wealthy will continue to treat the world as their playground. This screw, by the way, has another twist. In the Louis Vuitton ad Bono and his wife, Ali Hewson, wear a clothing line called Edun – get it. They own Edun – well, the half that hasn’t already been sold to LVMH Group (Louis Vuitton’s parent company). Since Edun’s founding five years ago a great deal of noise has been made about how it assists African farmers. Funny, the ad doesn’t mention that a portion of Edun’s manufacturing has recently been relocated to an undisclosed factory in China. This entry was posted on September 22, 2010 by Donna Laframboise in ethical & philosophical and tagged Ali Hewson, Bono, David Suzuki, Economist magazine, Edun, Louis Vuitton.